Experts provide guidance on selecting, planting, and raising tree species that benefit the local environment and sequester carbon. TIST provides training and incentives to farmers to plant trees on available land. TIST is encouraging development of tree nurseries that collect, and then germinate, seeds at the end of the rainy season. Certain small groups are interested in running nurseries that serve other TIST groups. Local species are grown from seeds collected at the end of the rainy season. These trees have proven their ability to survive in the harsh drought conditions of recent years. Tree planting provides shade for dwellings, windbreaks, and reduced soil erosion while raising the local water table. Trees that produce nuts, fruit, medicines, and pesticides will also be used in order to maximize the benefits to the participants. 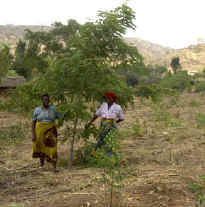 Although TIST will initially encourage mixed groves of trees planted near villages, around houses and along farm borders, later efforts may include introduction of fruit and nut species that may be successful in certain micro-climates in Tanzania . “factory forests” or “factory farms” are not part of the TIST effort. TIST tree planting creates a brand new market opportunity for the local subsistence farmer, sequestration of Carbon and the sale of Carbon Dioxide credits on the international market. With commercial scale implementation of reforestation, TIST expects to have planted nearly 6 million trees of assorted local species, just in one single region of Tanzania . With replications, the program could grow far greater. Each million trees translate roughly into 250,000 tons of carbon dioxide sequestration.